** WALK TO PLAZA!! 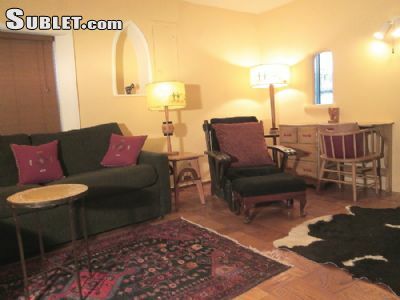 ** Charming Santa Fe-style adobe, private executive home for rent. Fully-furnished with all utilities paid. Available now. Minimum stay 30 days with extensions allowed as long as needed. $65/day - your private home for less than most hotels. Ideal for the traveling medical or other worker! We cater to traveling workers and do not force tenants to move out or raise our rents to higher rates in high season periods. We provide everything you need for extended stays, like quality linens and starter cleaning supplies. We are a professional company with 30 rental homes. Be the first to enjoy our first rental home in Santa Fe! All credit cards accepted. Location: Ideal location near the Capitol complex 6 blocks to Plaza & 2.2 miles to St. Vincent Hospital. Leave your car behind and stroll to the Plaza on your days off! Residential neighborhood. * Spacious kitchen with DISHWASHER, GAS STOVE & NEW REFRIGERATOR. 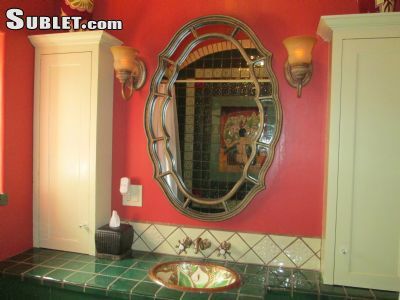 * Beautiful hand-painted tiles in bathroom and kitchen, Saltillo tile floors. * Cozy & comfortable Southwestern furnishings. * DELUXE BATHROOM is your wonderful escape after a day at work; it has a deep green tile soaking bathtub/shower with artistic tiling. Has vaulted ceiling and chandelier! * Small pet yard with unique cat fencing.